Cody Fransen was the only player to score in penalty kicks as the Trinty Western Spartans earned a 3-2 win over the No. 1 ranked York Lions on Thursday in the quarterfinals of the Canadian men’s university soccer playoffs. The No. 8 ranked Spartans will face the Montreal Carabins in the semifinals after their upset victory. Frederic Lajoie-Grav had a hat trick in Montreal’s 3-0 win over the New Brunswick Varsity Reds for its spot in the Final Four. Meanwhile, the Carleton Ravens will face the Cape Breton Capers in the other semifnal. Marcus Campanile scored on a penalty kick in the 81st minute to lift the Capers over the UQAM Citadins 1-0. 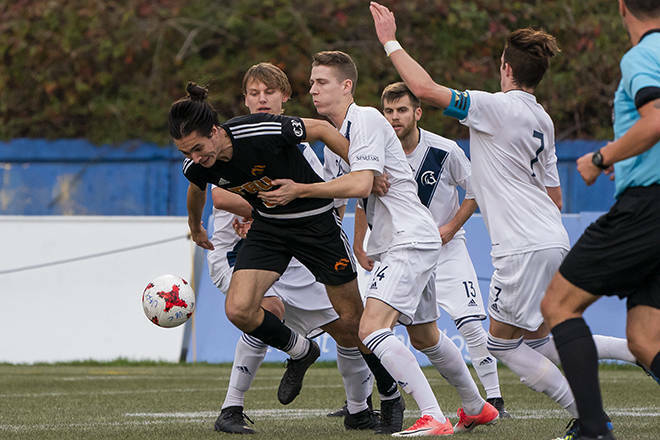 And Gabriel Bitar scored his second goal of the match in extra time to give the Ravens a 3-2 win over the UBC Thunderbirds. Both semifinal matchups go Friday.